Hidden in the mountains of northern New Mexico lies Blue Lake, or Ba Whyea, an ancient sacred site for the Taos Pueblo community. After the U.S. government appropriated Blue Lake and the surrounding area and placed it under the control of the Forest Service, the ensuing battles for Blue Lake came to epitomize Native Americans’ struggle for religious freedom and protection of sacred land. A statement issued by the Taos Pueblo during their fight to regain parts of their homeland proclaimed: “The story of my people and the story of this place are one single story. No man can think of us without also thinking of this place. We are always joined together.” After 64 years of protest, appeal, and lobbying by Taos leaders and their supporters, Blue Lake was restored to the Pueblo in 1970. From the 16th century, Spanish and Mexican authorities recognized Taos Pueblo land rights, and sovereignty was reaffirmed under the Treaty of Guadalupe Hidalgo in 1848 when the U.S. government acquired most of the Southwest including Blue Lake and the surrounding area. As growing numbers of white settlers traveled west by railroad, farms and ranches were established in the area and the land was exploited for various natural resources. 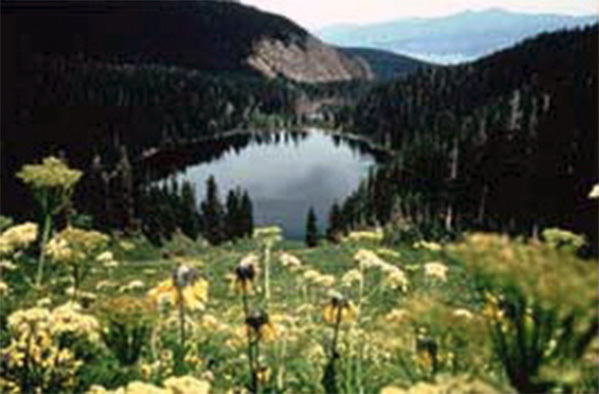 In 1906 the federal government placed Blue Lake and the surrounding watershed under the control of the Forest Service. The Pueblo Lands Act, passed in 1924 with the purpose of settling the land disputes, established the Pueblo Lands Board, which awarded the tribe compensation for Blue Lake and the surrounding area. The Pueblo offered to relinquish any monies for the territory settled by non-Indians if they could only acquire the title to their precious Blue Lake, but they were given neither compensation nor title. Taos elder Juan de Jesus Romero explained, “…if our land is not returned to us, if it is turned over to the government for its use, then it is the end of Indian life. Our people will scatter as the people of other nations have scattered. It is our religion that holds us together.” He argued that in taking Blue Lake, which is inherently tied to his people’s cultural traditions, the government threatened to erode Pueblo unity and their very identity. In 1933, after persistent protest by Taos Indians, the Senate Indian Affairs Committee recommended that title be restored. But instead, seven years later, the Department of Agriculture issued a permit of native use rights. After filing suit with the newly established Indian Claims Commission in 1951, it was affirmed that the land was taken unjustly by the U.S. government, but the commission could only award monetary compensation and could not return land. Two subsequent legislative initiatives failed to return the land to the Taos Pueblo. The Pueblo continued their sustained campaign for return of the lake, and recruited support from other tribes and the non-Indian public. With another Blue Lake bill (House Bill 471) in 1969, the National Congress of American Indians called for presidential support. In 1970, Richard Nixon endorsed the bill and the return of Blue Lake to the tribe. After hearings before the Senate Subcommittee on Indian Affairs, trust title for 48,000 acres, including Blue Lake, was granted to the Taos Pueblo and exclusive use of 1,640 acres surrounding the lake was reserved for tribal members. Blue Lake is now restricted to enrolled Taos Pueblo members. It was the first of two areas of land returned to Native Americans. Under the Nixon administration, in 1972, Mount Adams in Washington state was also returned to the Yakama Nation. In both cases, the privacy of the tribe is now respected, information about the places is proprietary, and there are no eco-tours. It took a long campaign for congressional legislation, and ultimately an executive decision, to restore Blue Lake to the Taos Pueblo people. Testimony by native practitioners, determined insistence on religious freedom and justice, and nurturance of public support over 60 years brought about a positive outcome. The Blue Lake case set a model precedent for sacred land disputes: by returning land to the tribe, impact was limited and permanent protection of the sacred place was ensured. Brookover, Linda. “The Blue Lake Victory.” OneWorld Magazine. Evers, Larry and Felipe S. Molina. “The Holy Dividing Line: Inscription and Resistance in Yaqui Culture.” Hiakim: The Yaqui Homeland Vol. 3, No. 1, Spring 1992. Gordon-McCutchan, R.C. The Taos Indians and the Battle for Blue Lake. Red Crane Books, 1995. Spicer, Edward H. Cycles of Conquest: The Impact of Spain, Mexico, and the United States on the Indians of the Southwest. University of Arizona Press, 1962. Stiny, Andy. “Taos Pueblo Celebrates Return of Blue Lake.” Albuquerque Journal, September 19, 2010.